In 1986, first-year med student Carlisle Cullen was not only on top of the world, but he’d also been on top of the majority of his female classmates. Can Esme Masen beat him at his own game? A FGB piece for katydid13. I am confused, there is no story? Hi there. 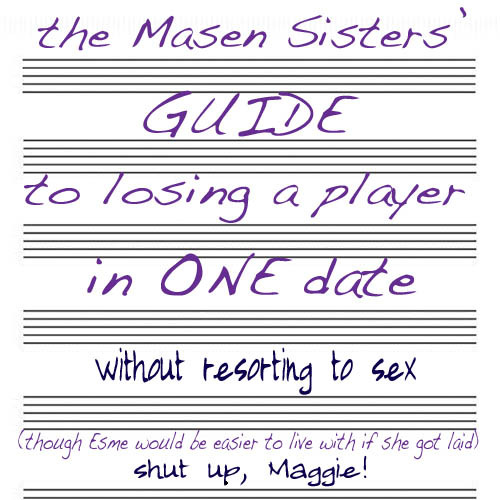 I received a notice of what I thought was a new story (The Masen Sisters’ Guide) and this ‘Leave a Reply’ page is where the link directed me. When I clicked on Step One, the page I landed on prompted me for a password. Do I need a password in order to read this story? If so, please may I know what the password is? If not, I’m curious why I received the notice in the first place. I really enjoy your stories and I would really like to be able to read this new one, as well. Colleen, I can’t remember my password to access / subscribe or if ever there was one to your site. I know the other site has a password. Would you please send me the password? Thank you very much! The site is not allowing me to access the story(? ), chapter(? ), whatever the heck it is without a password. I can’t remember setting a password and my old reliables don’t work. Clearly I am missing something. Your assistance would be appreciated. Thanks in advance. I sent the notification out by accident. It’s fixed now.